This post details the first spontaneous beer I have fermenting in oak. It is in a 225 L / 60 gallon barrel that I co-own with some friends, and so far it is progressing nicely. We filled this barrel with one big brew day - a turbid mashed brew taking inspiration from lambic production - using a bunch of our homebrew equipment pooled together. I'll focus mostly on our decision taking for this approach to the barrel rather than a solera-type approach and cleaning the barrel, but I'll also include more typical brewday stuff (our plan, recipe, process, etc). with a heat gun, beeswax and something like a putty knife. I've mentioned the origins of this barrel in this blog post. Since November 2014 this barrel has been full of a homebrew solera-type project. The initial fill was a saison with brett and Lactobacillus. After about 7 months we pulled off ~1/3 and re-filled with young (<1 month old) beer that was turbid mashed, open cooled and then pitched with various cultures (dregs, ambient wild microbes and lab cultures). A second partial empty and refill was done 14 months later, again with lambic-inspired young beer (and one portion was spontaneous this time). Since the initial fill, we felt that the beer wasn't really progressing the way we wanted. The end goal was something lambic-inspired and the group that shares the barrel has had a growing interest in spontaneous fermentation. But the partial re-fills with young beer weren't really pushing us in that direction as much as we liked. The beers coming out had increasing acidity, approaching levels beyond our goals for a balanced product, and the flavor complexity wasn't really developing as we wanted. Maybe this is influenced by the pretty strong presence of saison still in the barrel. Also, with the pitched cultures already present in the barrel we felt that we may have been preferentially feeding a subset of the organisms active over the course of spontaneous fermentation rather than getting the expression of a more thorough set of microbes over the course of fermentation. The barrel waiting to be filled the morning after the brew day. To be clear the beer coming from the barrel was fine. It was pleasant to drink and I've used it in blends (here for example). But the beer was lacking complexity, and we were looking for something more from the investment of time and the potential that we knew the barrel had. Our slightly underwhelming experience is not to say that a solera system inherently won't produce the beer we were looking for. Though I do think perhaps it is better suited for certain styles, at least as it is practiced by homebrewers. And maybe our goals weren't aligned with the strengths of a solera-type system. The typical homebrew solera is a bit different from the traditional solera system (for example as used in sherry), where a multiple barrel system is employed. With this system, refilling is accomplished using the next oldest product when the oldest product is partially removed. This continues up the line such that progressively younger but already aged product does the refilling for most of the levels. On the homebrew side when it can frequently be wort or rather young beer and a one-vessel system, the refilling may not done with an aged product. That's certainly the way we did it at least. And our experience may have been better if we refilled with 6+ month old beer rather than <1 month old beer or wort. Anyway, this specific barrel wasn't on our ideal track, so we were looking to completely empty, clean, and re-fill either way. With that in mind, along with the selective feeding idea and the end goal of spontaneous fermentation, we decided to step away from the homebrew solera approach and opted for a complete fill from one brew day, open cooled at one spot overnight, and racked in to the barrel without pitching any cultures. Completely filling a 225 L wine barrel on homebrew gear is not an easy task. We've done this before doing 3 brews in series. But that was with more simple infusion mashes and a shorter boil. With the long boils and intensive mashing process we were going for this time, we decided on brewing in parallel. If getting together with 3 of your friends to brew about 250-300 L of wort in order to have at least 225 L after overnight cooling sounds like a good idea to you, then I guess there's a few of us out there. If it sounds like a terrible idea, there's probably a good deal more in your camp. In all honesty it is probably a bit of both. We started the planning with a list of the equipment we had available to make sure we had the physical capacity to hold and heat that much liquid. We were bringing together 4 brew systems using different methods of heating and mashing (electric BIAB, electric w/ false bottom, stovetop BIAB and propane w/ false bottom), which required some shuffling to make it all work out. But with this and with the additional miscellaneous gear we had, the brewday could go forward. We split that gear into roughly 3 brews. Or at least 3 mashes, as some brews may require multiple boils. We designed these brews so they could be treated as more or less independent, but flexibility with this was key on brew day. In general things went as well as they did because we had enough people to problem solve and/or make runs for additional supplies as needed during the brew. -We planned for 3 mashes at the same time with one large electric kettle to heat the necessary strike and infusion water and one kettle for the combined turbid wort. -The boil would be split into ~5 kettles, as needed. As the volume dropped during the boil, and as we cleaned larger pots from the mash, we could combine into 4 total. -Our cooling plan was to use the bottom half of a Blichmann conical fermenter and two of the boil kettles. This gave us an estimated cooling capacity of around 285 L / 75 gal (we had to guess at the volume of the conical), which should be sufficient with evaporative and trub/hop losses to get near to the target of filling the barrel. The two electric boils and the extra extractor fan. We used about 60% locally grown and malted barley and 40% soft white wheat. Our turbid mash had 4 rest steps (dough in, protein, cool saccharification and warm saccharification) plus a mash out and 2 turbid pulls. 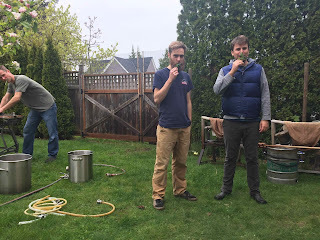 We generally followed the Cantillon turbid mashing process (see MTF and lambic.info for more specifics here, see also Wild Brews by Jeff Sparrow and this Funk Factory writeup). The snags on the mash side were trying to evenly split sparge water across mashes of different sizes and different types of mashes (which inherently drain at different rates). This was compounded by stuck sparges on the largest of the mashes due to the high load of difficult grains. While a benefit of turbid mashing is that it allows for overloading mash tuns, both in terms of fill level and in terms of proper conversion for good runoff, traditional Belgian mash tuns for this are more tuna can-shaped than our soup can-shaped tuns. So for the same volume our grain bed ends up comparatively deeper. This also made mixing difficult, as shown above, which could have resulted in worse conversion of the mash and could have contributed to the stuck sparge. Anyway, that was sorted out well enough, but it took a bit more time and made the splitting of sparge water (i.e. tying not to over-sparge some mashes and under-sparge others) trickier. Cooling vessels 2 & 3. We planned for a 3 hour boil and were fine with topping up the boil with water as needed. We wanted to fill the barrel completely so we were happy to take a small loss in OG if it meant a full barrel. We were hopping at a rate of around 3.8 g/l (based on the target end of boil volume) with aged pellets from hops direct and homegrown aged whole hops. We added these at the start of the boil. With the two electric systems going inside we needed to bring in an industrial extraction fan (in addition to the normal kitchen hood already active) to properly remove the moisture. We left these beers to cool overnight. The nighttime low for the area on that night was just under 8 C (about 46F). Wort from the two electric boil kettles was transferred to the lower part of the conical fermenter, and therefore this wort was removed from the hops. The other two pots of wort were topped up with remaining electric wort and left to cool on their own, so these still had at least most of their hops in contact. The wort remained to cool for a total of about 16 hours before being transferred into the barrel and the wort temperatures on the morning after cooling were 12 and 14.5 C (53.5 and 58 F) in the two boil kettles. So the temperatures, both ambient and wort, worked out great. We had decided to empty the barrel on the same day as the brew day. We figured there would be enough down time during the ~3 hour boil to allow for this, and we didn't want to store the barrel dry or use any sort of storage solution if it could be avoided (as both of those would require extra work rinsing and/or swelling before we could use it). This did add the challenge of needing enough empty carboys to hold a full barrel, and transporting those as well as all the gear, but at least we didn't need any carboys for the wort going in. We did this racking with a pressurized racking cane built with help from the engineer of the group. The basics of the cane follows this post on A Beer Diary, but with a cross instead of a plus to allow for a pressure relief valve (and this is a 1/2" cane rather than 3/8"). See also this FB thread on MTF. I'm behind on making use of the beer that came out, but that's another story. With the boil done (clearing up some outside space) and the barrel empty, we could turn out attention to cleaning the barrel. We wanted to do a fairly thorough clean for a fresh start. Our strategy was primarily 2 parts - a prolonged spraying followed by steaming. Our spraying out also included wanting to spray the inside top of the barrel, but we weren't able to easily reach that. We were able to get around this by bending a standard racking cane (after first softening it with a heat gun) to about a 30° angle, or perhaps a bit smaller, and cutting the extra length of the cane off. This allowed the end to fit into the barrel and direct the spray back toward the top. Now we had a visually clean barrel, but we had been using cold water which wouldn't do much to knock back the microbes that we didn't physically remove. For this we had a steaming plan. Steaming on a home scale can be a bit trickier. After trying to come up with some good way to do this, the engineer of the group came to the rescue with a converted pressure cooker. I think it is important to note here that you need to be very careful whenever you are working with steam and pressure. Be sure to have proper safety precautions in place and our method may not work for other setups/barrels. And there is definitely room for improvement. We used a converted stovetop pressure cooker with the primary weight-based pressure relief valve removed to have a hose attached to this opening. This hose was then put into a bung in the barrel, transferring the steam from the pressure cooker to the barrel. We still had multiple levels of pressure relief. First off, the secondary pin to release pressure on the cooker was in and therefore there was pressure relief on the cooker side. Secondly, we had multiple press-fit connections leading to the barrel to serve as release points in case we built up too much pressure. These were the connections from the tube into the bung as well as the bung in the barrel, which was not forced down as tight as one might do when aging in the barrel. We knew from experience with the racking cane that the bung could pop out under a low pressure when it is not strongly forced into the barrel. We started the steaming of the barrel with our "Vinnie nail" out, allowing venting of the steam out of this opening. With this, while steam entered the barrel, the barrel was not warming up as much as we would have liked. So we replaced the nail after about 5-10 minutes and continued steaming in a closed system with the aforementioned engineered weak points (or if German-inclined, sollbruchstelle - one of my favorite German words). I didn't keep good track of steaming time, but it was clear the steaming was doing its job. First the heads of the barrel became warm to the touch. The exterior of the barrel was wet from rinsing before the steaming, and we could see this moisture evaporating away. Then the sides of the barrel also became warm to the touch. Eventually our engineered weak points did their job, venting the pressure, and we decided to end the steaming there. We felt a sufficient enough job had been done as it was probably at least 20-30 min of total steaming (with and without the nail in place) and all exterior surfaces of the barrel were quite warm. With a bit more planning time we'll hopefully have a better setup next time. I think it wouldn't be too tricky to work in a pressure relief valve like. Basically the same design as the racking cane should work (and only a T fitting would be necessary, rather than the cross on the cane). Though again, from out experience, the bung on that cane pops out before the pressure relief valve is active anyway. But more pressure relief options are probably not a bad thing. Another option would have been to try longer with the sampling nail out. Perhaps with more time to build up heat this would have worked well. We returned the morning after our brew day to fill the barrel. The pots that could be lifted easily were carried over to the barrel for filling. The others were transferred into intermediate smaller pots and then carried over. Filling the barrel went fairly smoothly, but it was clear fairly after working through the conical that we had undershot our volume. We had a bit more than expecting in our evaporative loss. And a calculation error meant that we were high in gravity but low in volume. This was an easy problem to solve and we diluted in the barrel with extra water (which had been heated to above pasteurization temps from the day before). In the end, based on a gravity points and volume calculation, we had an OG of around 1.055. Other than this volume challenge, and some slow flow on one of the kettles due to clogging a hop filter, the filling of the barrel went pretty smoothly. We ended up leaving a small amount of head space in the barrel. It probably only amounted to about 10-15 L, but we figured this might help keep the avoid absurd blowoff while still keeping the barrel almost completely full. And we filled a carboy with the extra wort for fully topping up the barrel after primary. of every brewday. photo: J Young. Interestingly, there was a clear difference in the fermentation progression of the barrel and the carboy. This fits with data on the inoculation of lambic from Spitaels et al. (2014), which reported microbes present inside of cleaned barrels that weren't detected elsewhere in the brewery. It is certainly possible to clean a barrel more thoroughly than we did, but I think we did a pretty reasonable job with the physical removal and then given how warm the outside of the barrel was after steaming. For me, this difference in fermentation from the two vessels helped to confirm previous anecdotal experience form myself and other as well as available published data that fermentation vessels can impact inoculation in spontaneous beer. I am not very convinced that a barrel can be made sterile / as clean as a carboy and I think this can be important. Anyway, after a few months (from reports from the other folks involved in this brew) the carboy was a bit unpleasantly bitter while the barrel did not have this bitterness. The carboy was transferred into the barrel after we felt that the risk for blowoff was gone. The barrel also developed a bit of a "sickness" after active primary fermentation while the carboy did not. I'm excited to see how this beer develops over the coming year(s). Hopefully I'm back around to deal with it when we remove it. And hopefully I can be involved in the next ill-advised filling session. Our plan for now is to let the beer go in the barrel for a couple years, while monitoring it's progress here and there. We're certainly not in a rush to empty it and re-fill it.